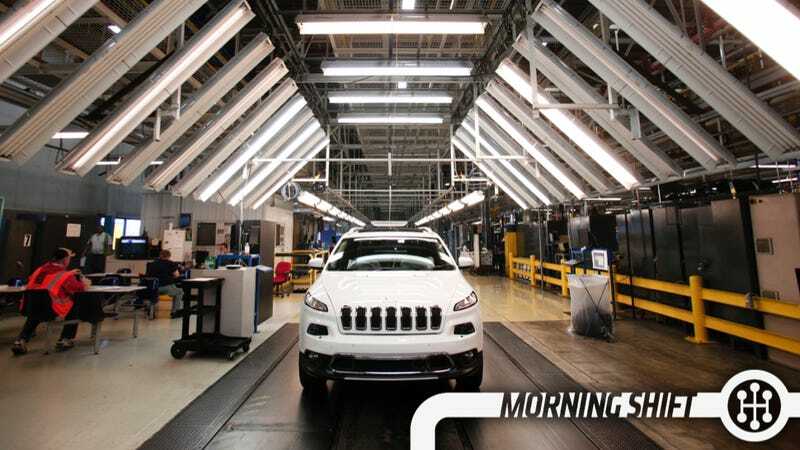 When we leaked early photos of the 2014 Jeep Cherokee there was a lot of "no way" and "that'll never sell" and "what the hell is Jeep thinking." When we reviewed the Jeep we even led with the headline [It's] Better Than You Think It Is." And customers agree, with Jeep's little Cherokee becoming the best-selling vehicle in the lineup in the first year on its way to 170,000 annual sales. Despite the botched launch. Despite the transmission issues. Despite the face. Despite the fact that it's not "a real Jeep" in the eyes of some. About 2 out of every 3 buyers, according to Morrison, opt for the Cherokee's four-wheel-drive system that offers three driving options and a segment-first rear-axle disconnect that seamlessly switches between two- and four-wheel drive to improve fuel economy and performance. I think what he's saying is that the 4WD is letting them break on through to the other side... of the market. Car companies love smashing together like so many drunk freshman at an Ohio State game, yet BMW's head of finance Friedrich Eichner told one of Germany's many newspapers that it's not a good idea. "I cannot think of a positive example in the car industry," he said. "Given our broad portfolio and our clear positioning in the premium car segment, I don't see any need for BMW to think of a merger." He also said they should grow in 2015. We'll see a new big truck from Nissan, the first since they launched the Titan to... some applause in 2003? Someone had to applaud somewhere, right? I actually don't dislike the Nissan Titan it's just that it's so old and there's nothing particularly special about it — probably why they're only selling about 1,000 a month (the F-Series sells 60k a month). We'll see the new Titan at the Detroit Auto Show according to the Freep and it'll be entirely new. But how so? 4th Gear: Ford... Expanding In The UK? Like many other global automakers, Ford has been cutting back in the U.K. lately so the news that Ford is actually expanding there is a bit of a pleasant surprise for those who care. Granted, it's just 318 jobs building clean engines, but that ain't nothing. The money is part of 1.5 billion pounds being spent over five years to produce engines and other technology that result in lower carbon emissions from its automobiles and vehicles, Dearborn, Michigan-based Ford said in a statement today. The U.K. government will provide 8.9 million pounds of the money being spent on the project in Dagenham. This is totally just for me because I spent a lot of my senior year working on a thesis that revolved around the prospects of Transit Oriented Development — i.e. real estate built specifically around mass transit. There's a great story in the WSJ detailing how TOD works without ever using the term. Basically, transit-adjacent property is often valuable and often owned by local transit agencies. Selling it or renting it to developers to build a mixture of commercial and residential properties has a sort of reciprocal effect: More riders for transit and more customers/residents for the development. One of its highest-profile developments is above a Metro train station near the intersection of Hollywood Boulevard and Vine Street, which provides rent payments of about $750,000 annually. A decade ago, the property housed a gritty parking lot. Today, the intersection holds large-scale developments including luxury condominiums and a W Hotel. Mass transit, like literally every other form of transportation, is subsidized in part by the government. The difference for mass transit is that they're almost always in the negative because they don't charge a fair equivalent to their costs (nor should they), so moves like this are great. At 3 p.m. on October 20, 1965, the very last PV-series Volvo drives off the assembly line in Lundby, Sweden. The car, a zippy black Sport PV544 with red interior trim, went straight to the Volvo Museum in Gothenburg. PV-series Volvos had been in production, first as the PV444 and then as the PV544, since 1947 and 440,000 sold in all. By the end of its run, the PV was old-fashioned–looking—the company had made very few cosmetic changes in the two decades the car had been on the market—but it remained a good, solid automobile. "Above all," Road & Track magazine said in 1963, "the Volvo PV544 is such a practical car. Volvo's most attractive appeal lies in its solidity and its quality in every single respect. There is nothing slapdash or under-dimensioned about any part of the car and that is more than enough to compensate for any perceived lack of glamour." Neutral: Did You Think The Jeep Would Succeed? Why/Why Not?